My desktop PC, which I wrote about its build and benchmarks previously, has performed very well since I built it late last year. However, I built it on a budget, so I wasn’t able to outfit it as well as I would have liked. After deciding that I would use the desktop computer as my primary computer, I upgraded it with those components that I needed most: more storage space and more RAM. The most pressing need was additional hard drive space. The original ADATA 128GB SSD was adequate when I was testing the system and deciding if I wanted to use it as my primary computer. When I wanted to do more than just the bare necessities and have access to my data more quickly than an external backup hard drive or flash drive could provide, I added two hard disk drives. First, I picked up a Toshiba 5400rpm 2TB OEM drive when Microcenter had them on sale. I had good luck with Toshiba drives from Microcenter with previous computer builds, so I was comfortable using a larger format capacity one in this computer. Due to the limited warranty on OEM drives, I put the drive through its paces to ensure that it wasn’t a lemon: I performed a low level format on the drive, and then I began the laborious task of moving files to the drive via USB and over the network. Then, I culled through the copied files to remove duplicate files. Finally, I erased the free space to stress test the drive again. Second, I waited for another sale at Microcenter and purchased a Western Digital Blue 5400rpm 4TB drive. After adding it the computer, which required routing the power cable and SATA cables differently than I had done before, I stress tested the new drive with a low level format (this took all evening to perform!) and then copied everything from the Toshiba 2TB drive to the WD 4TB drive. Another important need was additional RAM for the software that I use–multiple productivity applications, Wolfram Mathematica, and games. The Gigabyte B250-DS3H mATX motherboard supports four sticks of DDR4 RAM. I bought the computer’s first dual-channel pair of Crucial DDR4-2400 4GB RAM sticks at an amazing discount. Unfortunately, DDR4 RAM prices rose and have stayed elevated since that time. When a more modest discount was offered than originally, I chose to take it. Now, all four DDR4 slots are filled with two pairs of Crucial DDR4-2400 RAM for a total of 16GB RAM. I dabbled with VR before video card prices went through the roof. For this experiment, I upgraded the video card and PSU. I don’t have the video card any longer, but I kept the Corsair CX650M PSU so that I can switch out video cards for something more powerful in the future. Inspired by LEGO’s Death Star playset, which is both enormous and scene-focused, I built a 64 x 32 stud MOC of Temple Island on Ahch-To from Star Wars: The Last Jedi. First glimpsed at the end of The Force Awakens and explored in the latest installment, Temple Island is the home of the first Jedi Temple, and it is where Luke Skywalker has been hiding away during the rise of the First Order under the leadership of Snoke and supported by Luke’s former pupil, Ben Solo or Kylo Ren. As a LEGO playset, it has to balance accuracy, playability, and scale. For accuracy, I based the island’s shoreline on Ireland’s Skellig Michael, which is the location where these scenes were shot for the film. Also, the island’s topography were adhered to as closely as possible by having the north peak slightly lower than the higher south peak, and designing a middle valley between the two peaks, known as Christ’s Saddle on Skellig Michael. Each major scene involving Temple Island has been placed approximately where it would be on the island according to The Art of The Last Jedi and my observations of the film. And, each scene is scaled for play with LEGO minifigures, except where the Millennium Falcon lands along the shoreline, which would otherwise dwarf the island or require building a much larger model! For this element of the MOC, I used the Falcon included in last year’s LEGO Star Wars Advent Calendar (75184). Including all prep time, this build took me about 40 hours. In addition to studying books and magazines that showed glimpses of Temple Island and its topography, I watched YouTube videos such as these: one, two, and three. I leveraged Gimp’s grid rendering to plan the overall design based on a Google Maps’ satellite image of Michael Skellig. Also, I purchased additional LEGO to supplement what I already had on-hand: two 32 x 32 stud blue base plates to construct the MOC on, one green Creative set (10708), and two LEGO Ahch-To Island Training sets (75200). Below, I am including highlights from the construction process and the completed model. At the end, there are links to these albums with more photos of the MOC: Google Photos and Imgur. View more photos of the model and its development on Google Photos or Imgur. Over the past two weeks, I built a new desktop computer to replace my i5-based Intel NUC, because I wanted more CPU horsepower and a dedicated graphics card. The NUC6i5SYH has a soldered i5-6260U CPU. This part has only two CPU cores, which support two threads each for a total of four threads. With this new build, I use a socket-based i7-7700, which has four CPU cores, each of which supports two threads for a total of eight threads. Coupled with a higher, maximum clock rate, this i7 processor can do more work in less time than the i5-6260U CPU in the Intel NUC. For watching 1080p videos and lower resolution 3D graphics, the i5-6260U’s integrated graphics are more than sufficient. However, I wanted to play some 3D games and use Unreal Engine 4 for a project. The entry-level graphics of AMD Radeon’s RX 550 coupled with a design that does not require a higher-wattage PSU seemed adequate for this particular build. With any computer build that I undertake, I am most interested in maintaining access to legacy software and operating systems for my research. While I haven’t tested everything, I have confirmed that Sheepshaver/MacOS 7.5.5 and VirtualBox/Windows 98 are up-and-running. After this preliminary setup, I ran the following benchmarks to stress test and evaluate the system. The results are included below as a measure for anyone interested in how a system like mine performs. Using the evaluation copy of Performance Test 9, the CPU Test yielded a result of 11,399, which places the system above the average for this CPU and in the 92nd percentile. I opted for the budget/entry-level RX 550 video card, because only a few games that I play would benefit from a greater investment in this part of the overall build. Nevertheless, I was pleased with the 3,954 3D Graphics Mark result, which places the system in the 71st percentile. My system earned a Heaven Benchmark score of 843 and it sustained an average 33.5 frames per second. In the Valley Benchmark, my system gained a score of 1,415 with an average 33.8 frames per second. After creating a character and running the benchmark, my computer earned a score of 8077, Extremely High performance, and it maintained an average 59.933 frames per second. Performance: Extremely High -Easily capable of running the game on the highest settings. Benchmark results do not provide any guarantee FINAL FANTASY XIV: A Realm Reborn (Windows version) and FINAL FANTASY XIV: Heavensward (Windows version) will run on your system. FINAL FANTASY XIV: Heavensward Official Website http://na.finalfantasyxiv.com/pr/(C) 2010-2015 SQUARE ENIX CO., LTD. All Rights Reserved. Then, I ran the test again in 1080p resolution in full-screen mode. This resulted in a lower rating of “high” with a numerical score of 4,416. I ran the Final Fantasy XIV Stormblood benchmark twice–once at 720p in windowed mode (default) and once at 1080p in full screen mode. I imported my created character from Heavensward into Stormblood. In 720p, windowed mode, my system scored 10,877 (extremely high). This software does not guarantee that your system will run the Windows versions of FINAL FANTASY XIV: A Realm Reborn, FINAL FANTASY XIV: Heavensward, and FINAL FANTASY XIV: Stormblood. FINAL FANTASY XIV: Stormblood Official Website http://na.finalfantasyxiv.com/pr/(C) 2010-2017 SQUARE ENIX CO., LTD. All Rights Reserved. Next, I ran the benchmark again but in 1080p resolution and in full-screen mode. This time, my computer scored only 5,807 (very high). Watching the benchmark demo unfold on my monitor was exciting, and the game looked gorgeous! While I certainly understand choosing components for overclocking, I opted for a build that was stable first and provided performance second. I am very happy with my system’s stability and performance. If your processing needs outweigh your graphics needs, I recommend building a system similar to this one. Photo courtesy of Ryan Cox. 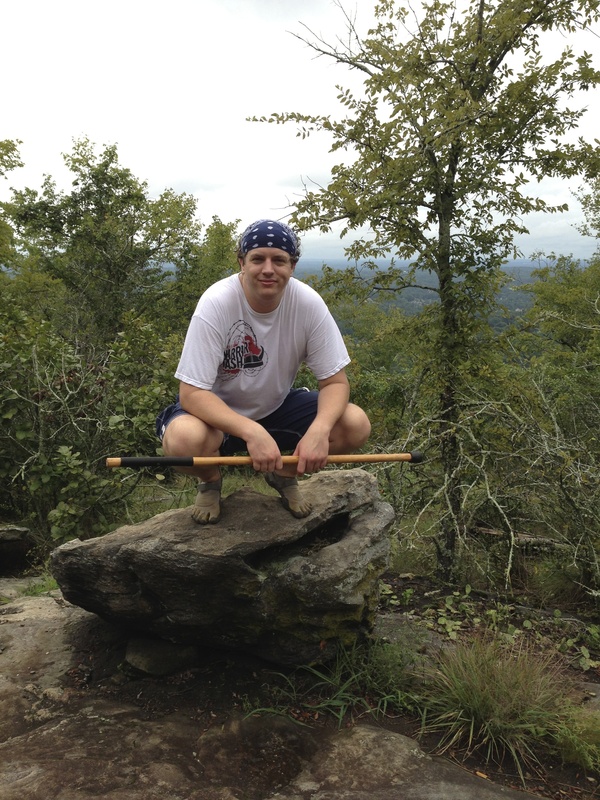 My cousin Ryan Cox is a longtime practitioner of a variety of martial arts including kung fu and tai chi. Ryan and his two older brothers–Ian and Jarret–grew up learning, sparring, and developing uncanny skill in hand-to-hand combat and weapons sparring. 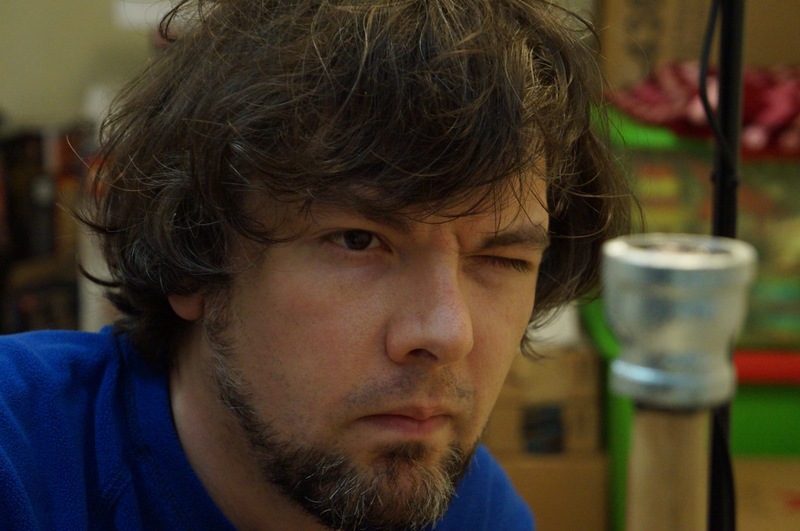 While Ryan and his brothers have developed rhizomic networks to enhance their abilities and pass on what they have learned to others, Ryan has went the most far afield when he traveled to Wudang Mountain to train with the kung fu monks who reside there. When we were younger, I remember myself being the one drawn to the Star Wars mythos more than anyone else in my family, but now Ryan tells me that he was always interested in the Jedi, their mystique, and their lightsabers. In more recent years, he has learned a lot of the backstory of the Star Wars universe from books and video games. His knowledge in those realms far outstrips my own. 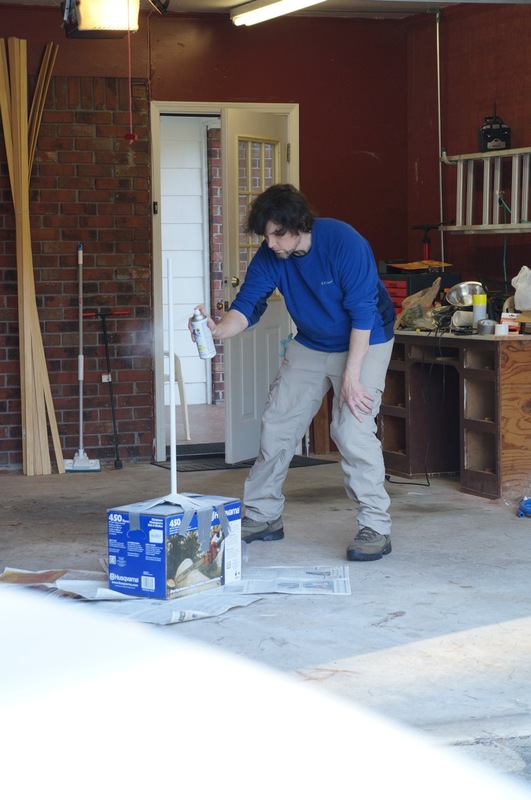 So, I was intrigued when he began talking with me about building his own lightsaber for demonstrating his swordmanship and possibly sparring if the “blade” were strong enough to withstand strikes. 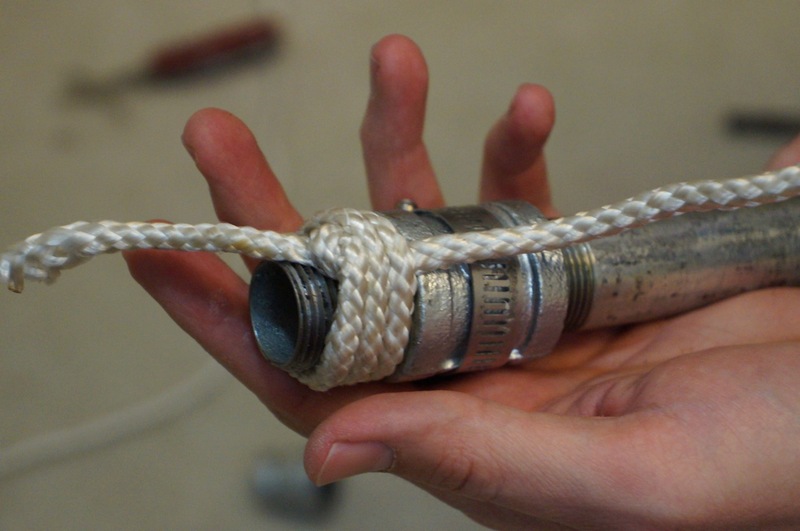 The guide that follows illustrates the first lightsaber that I built for Ryan in the fashion of General Rahm Kota’s. 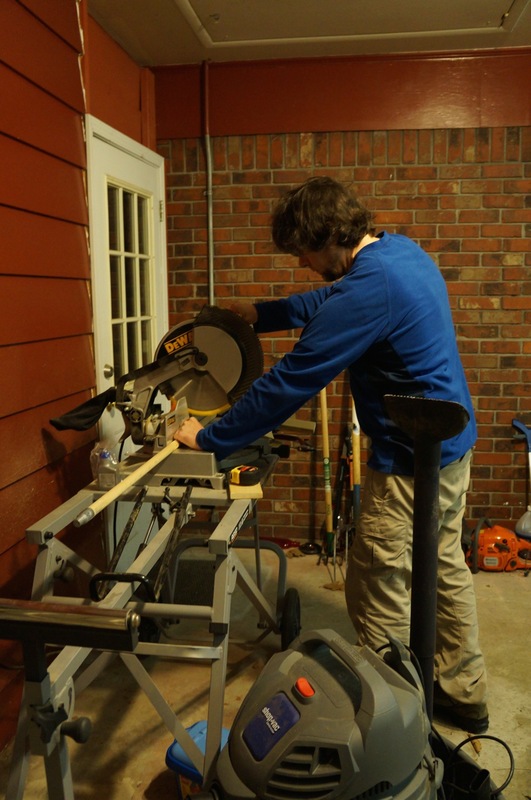 I used off-the-shelf parts easily obtained at Home Depot or any hardware store. 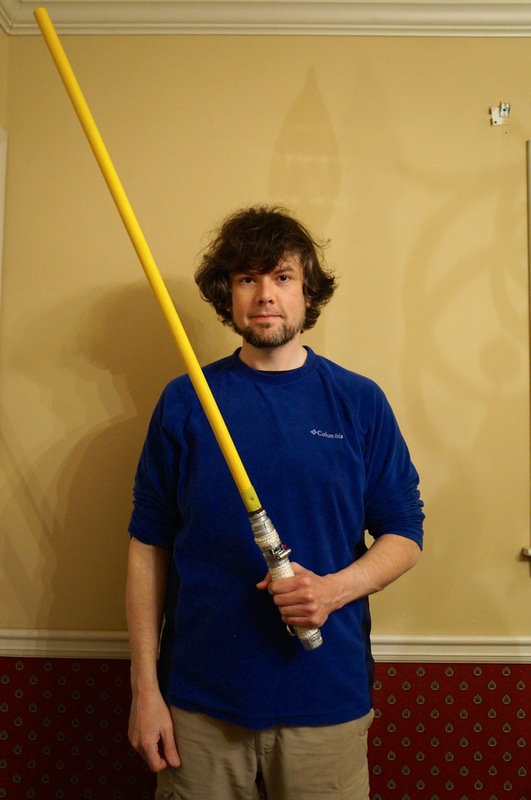 Since I built this lightsaber, Ryan has modified it more, and I have built two lightsabers for myself–one that resembles Luke Skywalker’s Return of the Jedi lightsaber and one that resembles Darth Maul’s The Phantom Menace double bladed lightsaber. 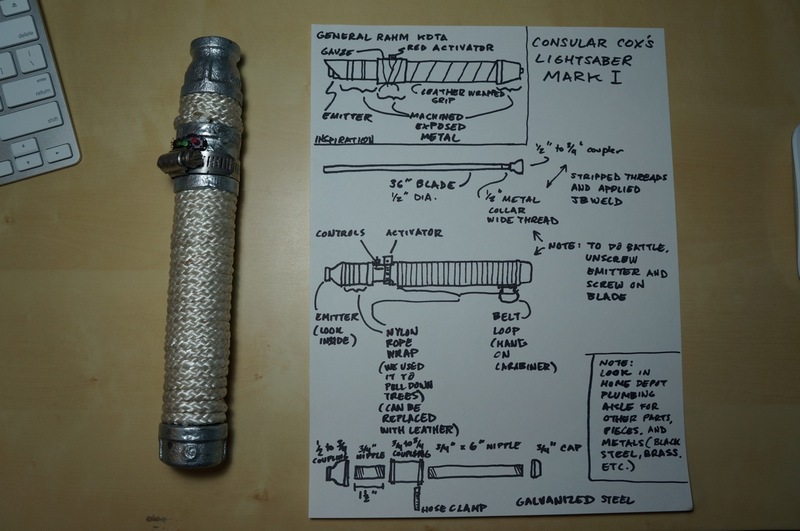 This guide focuses on Ryan’s “Mark I” lightsaber. Pedagogically, I promote the idea that haptics, building, and making are integral parts to any kind of education. We are embodied beings who do things physically in the world–whether it be in real life or online. I enjoy building things in my own time as another way to think about things–in this case, Star Wars, science fiction, Jedi mythos, world building, canon vs. noncanon, and design considerations: rhetoric of technology, aesthetics, practicality, etc. In Ryan’s case, haptics, proprioception, and movement are integral to his learning and lived experience. I am looking forward to learning from him with this artifact that I designed and built. The modes are the same–physicality, materiality, and haptics–but our efforts converge from different directions for a kind of haptic, learning synergy. 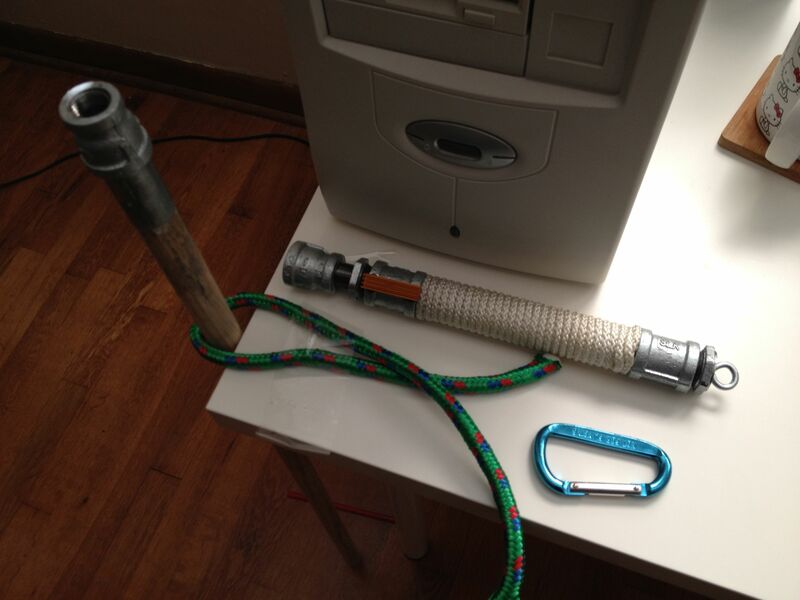 I began the project by assembling the parts that I needed for creating the lightsaber’s hilt and belt clip. I carried an image of Rahm Kota’s lightsaber on my iPhone and went to the plumbing aisle of my local Home Depot. 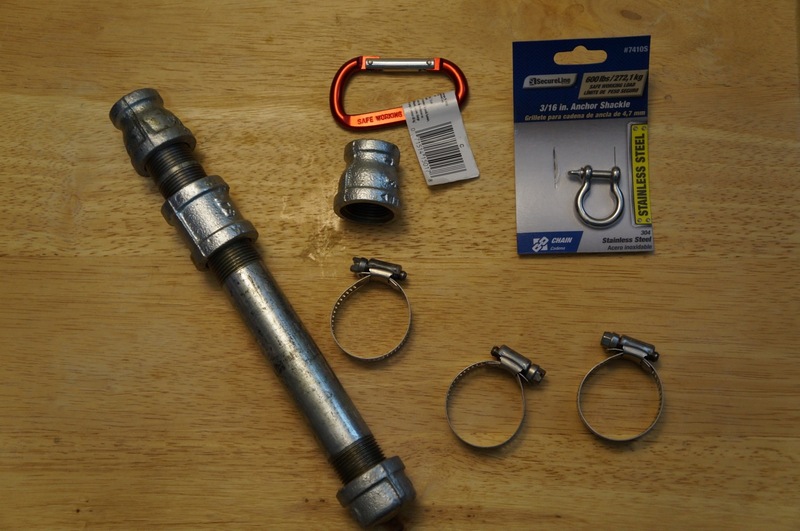 To create the lightsaber’s handle, I screwed all of the handle components together except for the 3/4″ to 1/2″ coupling like this: 3/4″ cap | 6″ x 3/4″ pipe | 3/4″ to 3/4″ coupling | 3/4″ close pipe. 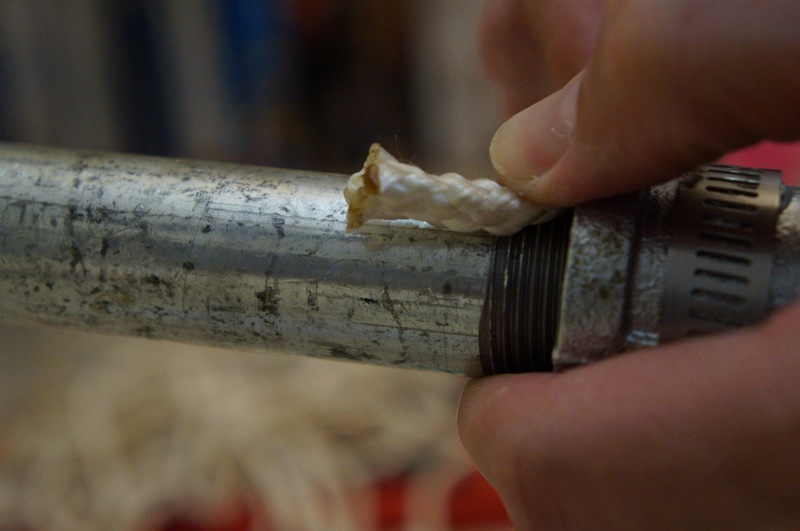 Then, I prepared the nylon rope to create the grip on the two pipe sections (6″ pipe and close pipe) by burning frayed ends to melt the nylon. 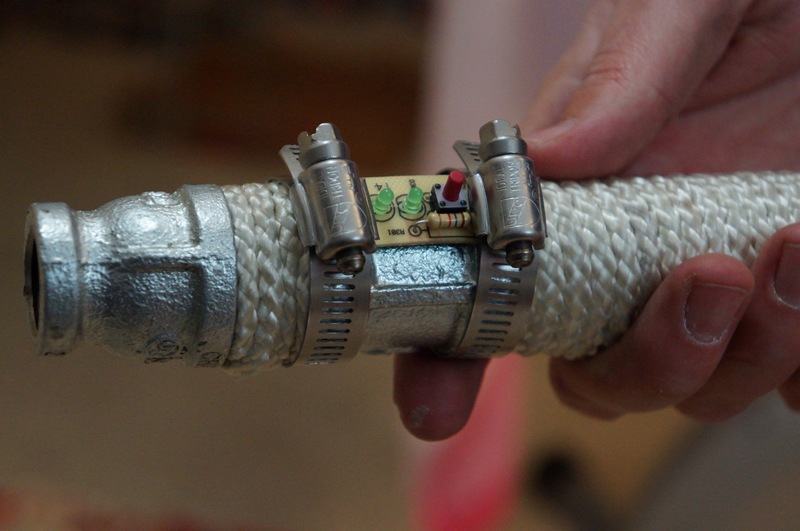 Beginning at the business-end of the lightsaber, I tucked a small piece of rope under the first wrap against the 3/4″ coupling to hold the rope in place and prevent unraveling. 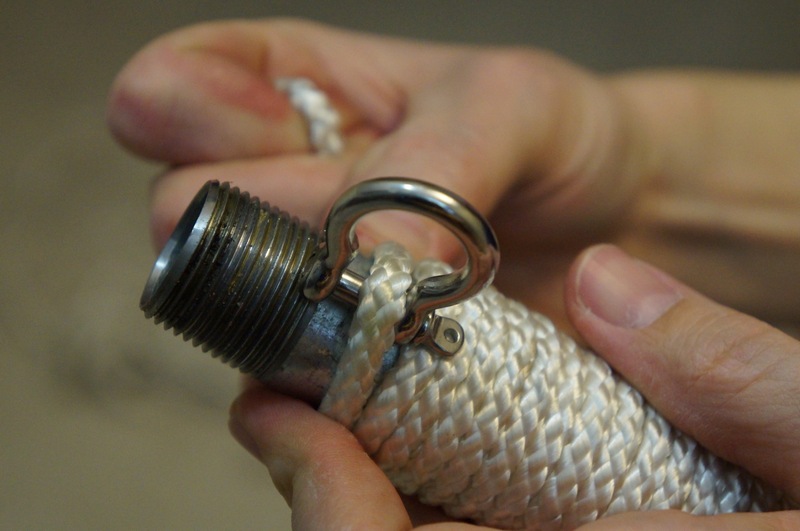 At the top end, close to where the 3/4″ to 1/2″ coupling (or lightsaber emitter/business end), I created a loop with the rope under the last wrap, which I ran the last wrap through and pulled into the wrap, which hid the end of the rope under the wrap. I cut the loose ends. 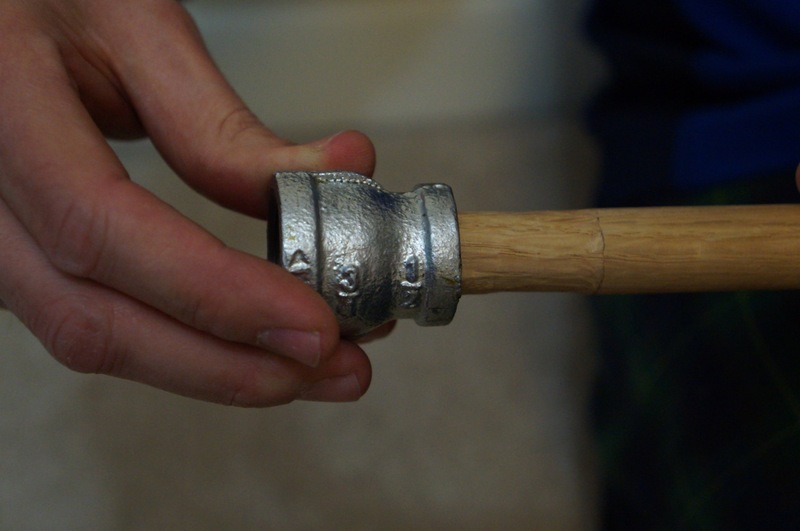 Beginning on the other side of the 3/4″ coupling, I repeated these steps with the longer wrap of the 6″ pipe section. First, a small piece under the first wrap. 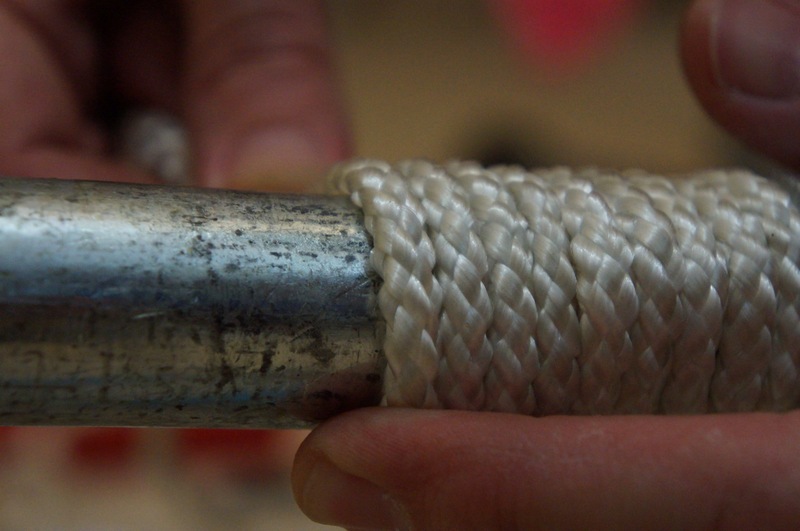 I pulled the rope tight around the pipe and pushed each wrap down to keep the grip as tight as possible. 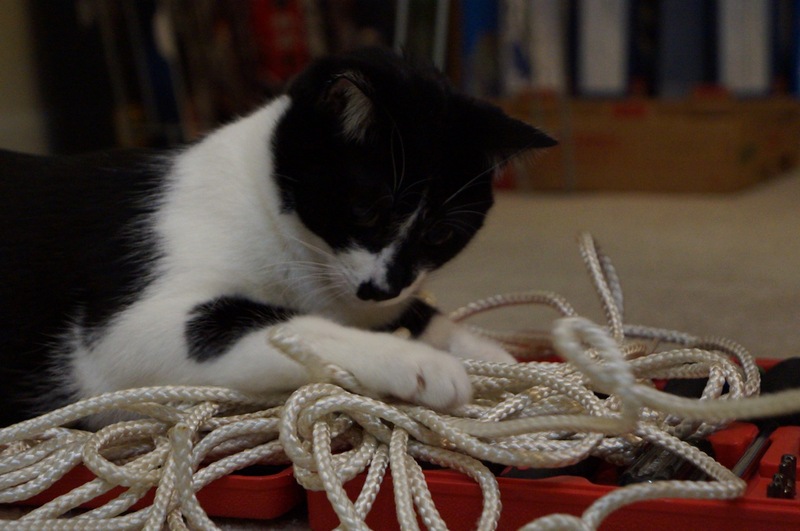 Mose tried to help with the process as much as possible. 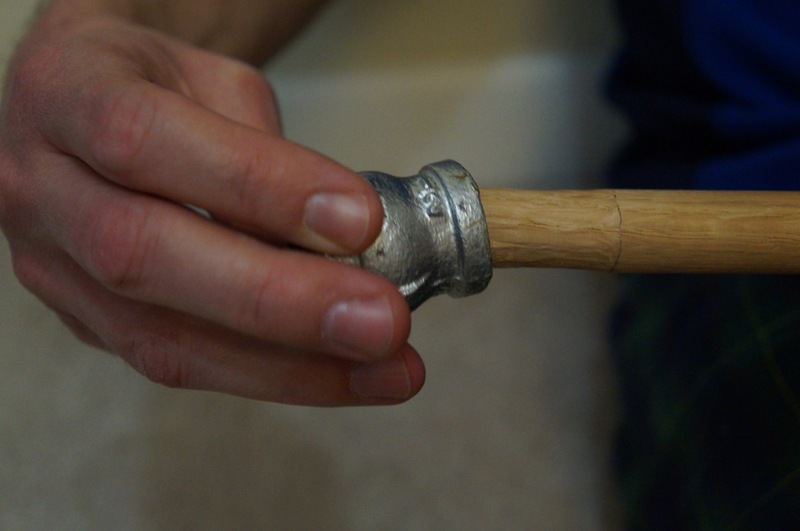 At the end of the 6″ long pipe, close to where the end cap goes, I placed the D-Ring and ran the rope through its eye to connect it to the handle. 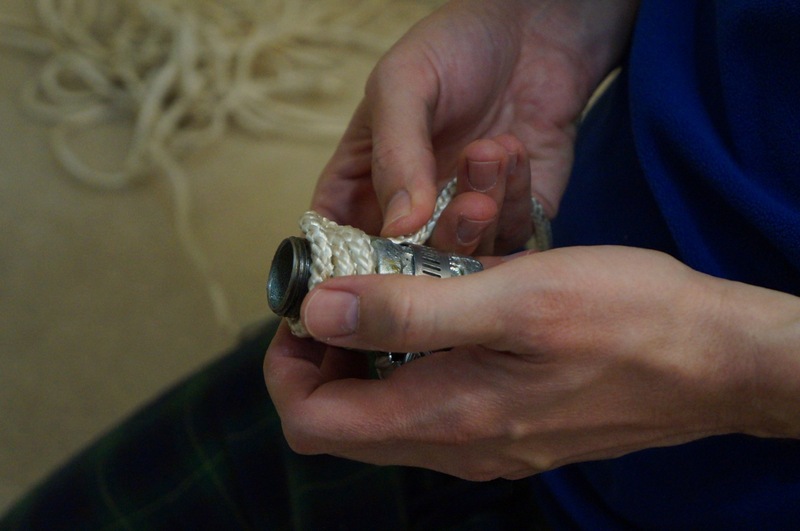 As in the shorter section wrap, I created a loop and pulled the end of the rope through and under the last lines of wrap to hide the end and prevent the grip from unraveling. Finally, I installed the cap. 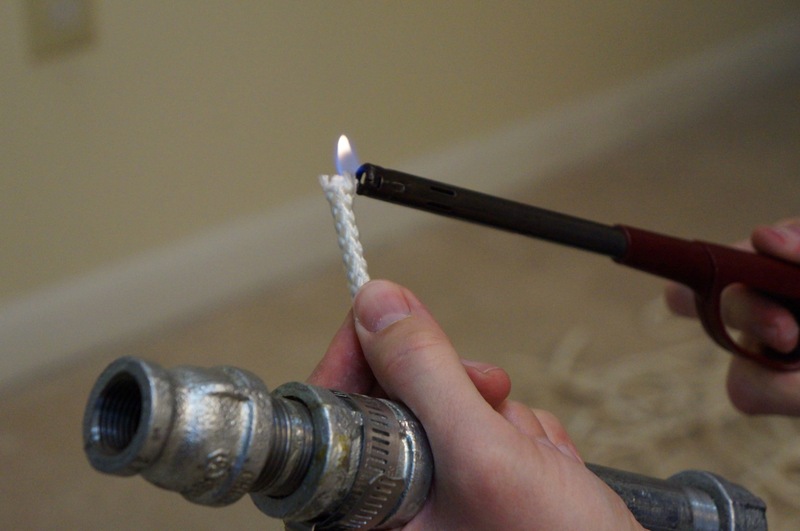 Before doing this, I wrapped the grip higher than necessary so that the the cap would compress the wrap when tightly screwed onto the 6″ pipe. Since Ryan would likely bang his lightsaber when sparring, I wanted to make it as practical as possible while giving it a technological appearance. 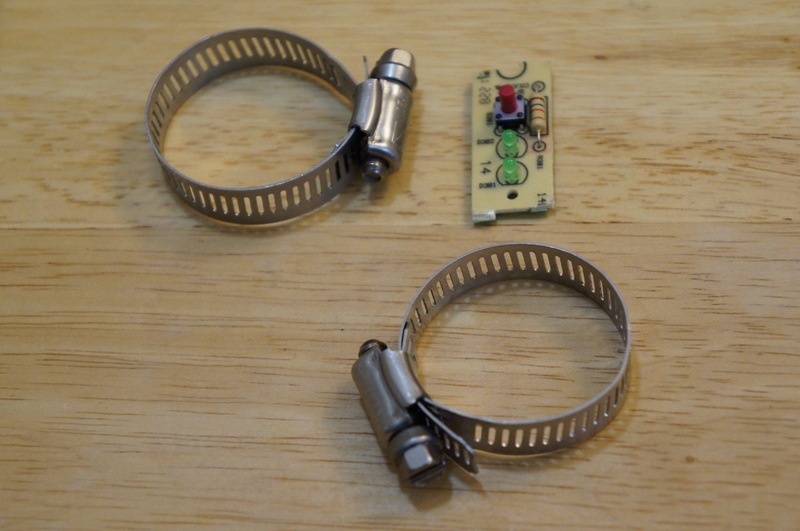 First, I tried attaching a circuit board from an average doorbell button with two hose clamps. 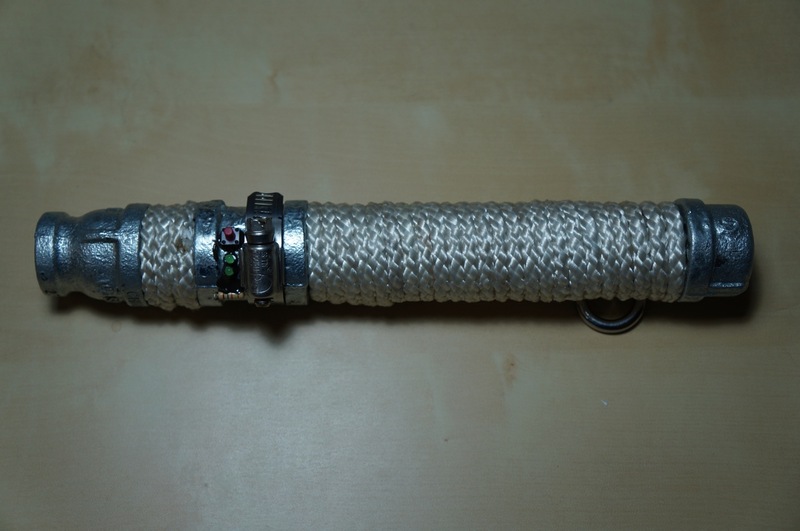 While I thought this fit the rugged look that Ryan might like for his lightsaber, I thought that it would be more practical to use only one hose clamp and affix the doorbell components with JB Weld after removing them from the circuit board. I liked this configuration best. 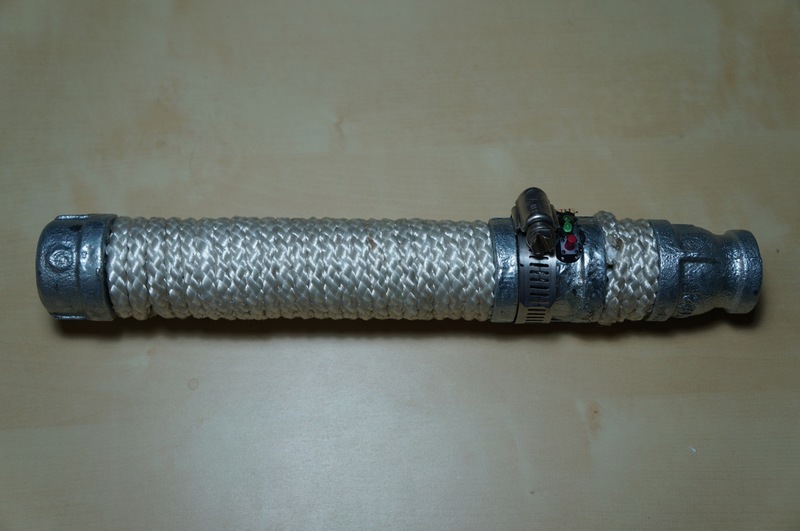 The hose clamp protects the switch, lights (non-functional), and resistor. 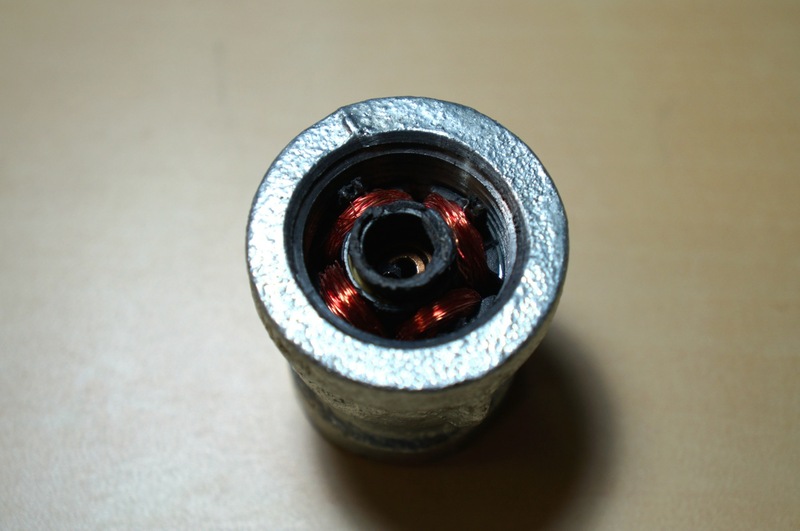 Next, I wanted the display emitter on the deactivated lightsaber (3/4″ to 1/2″ coupling) to look “realistic,” so I pulled the electromagnet from an 80″ computer fan, crushed it with my channelocks, and inserted it into the 3/4″ end of the 3/4″ to 1/2″ coupling. Repurposing the electromagnet draws on a visual/physical rhetoric of technology in the same way that movie props and set design use this for world building, extrapolating, and establishing plausibility. 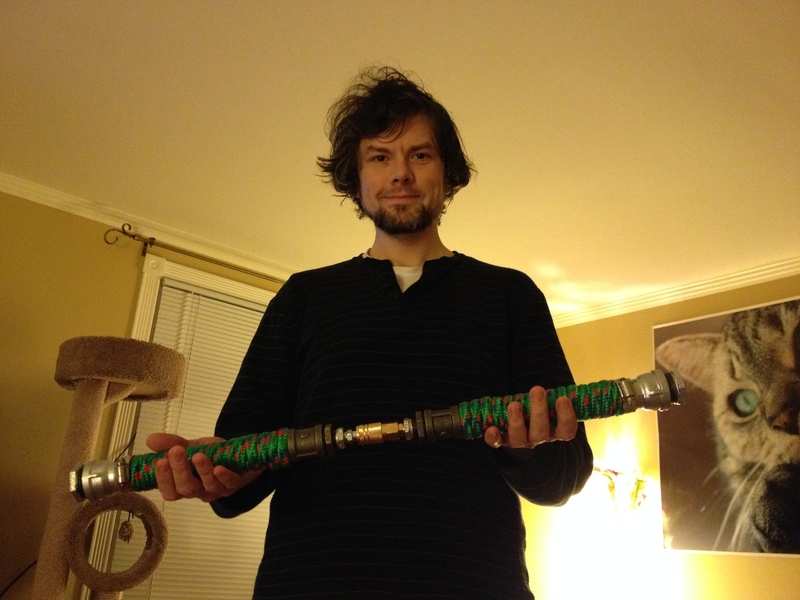 The next phase of the lightsaber build involved the other sparring emitter. 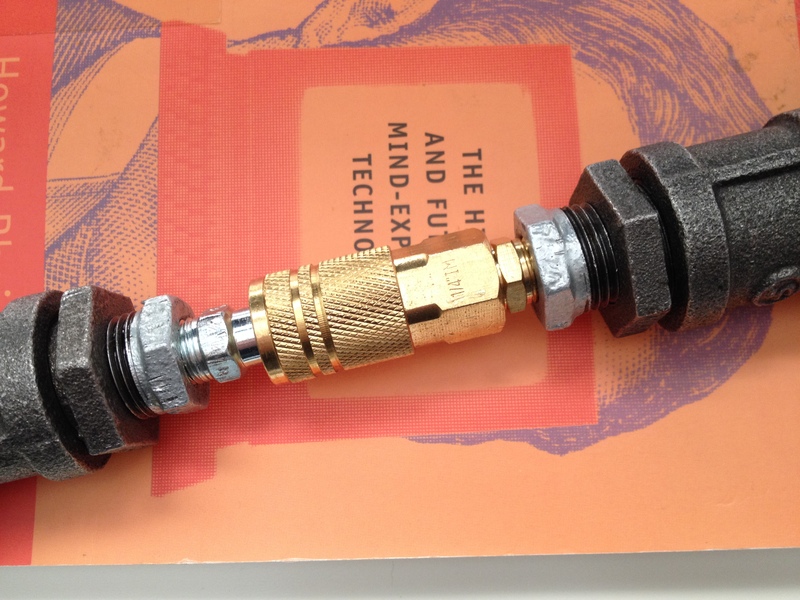 I needed to rigidly attach a wooden blade to the second 3/4″ to 1/2″ coupling in the 1/2″ end of the coupling and paint it to match the yellow blade color that Ryan sought (signifying the Consular Jedi). 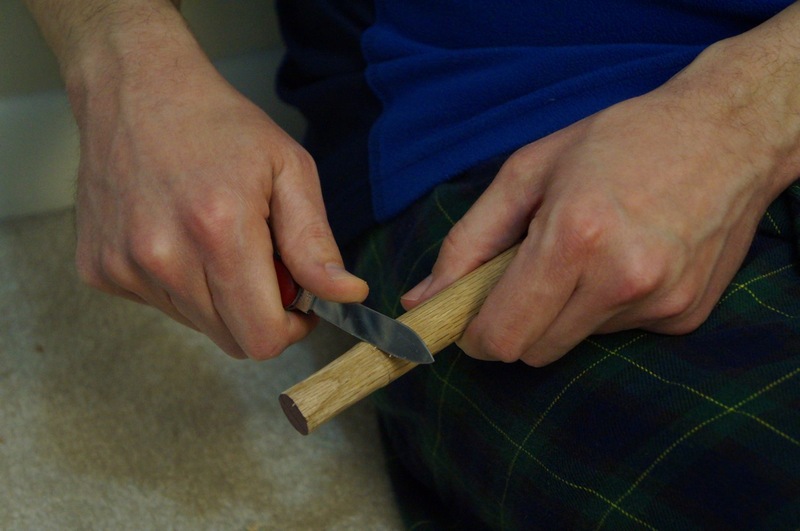 I began by taking an oak dowel rod and whittling one end enough to screw it into the 1/2″ end of the 3/4″ to 1/2″ coupling. 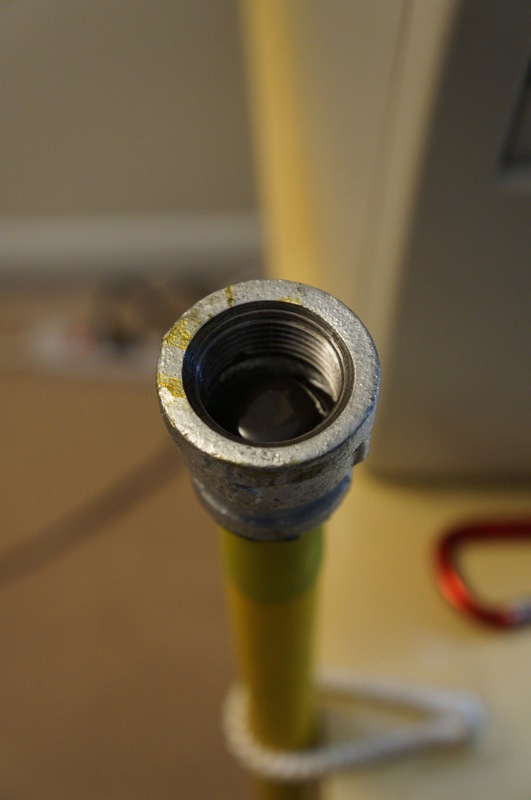 Then, I used JB Weld to permanently connect the coupling to the dowel rod. 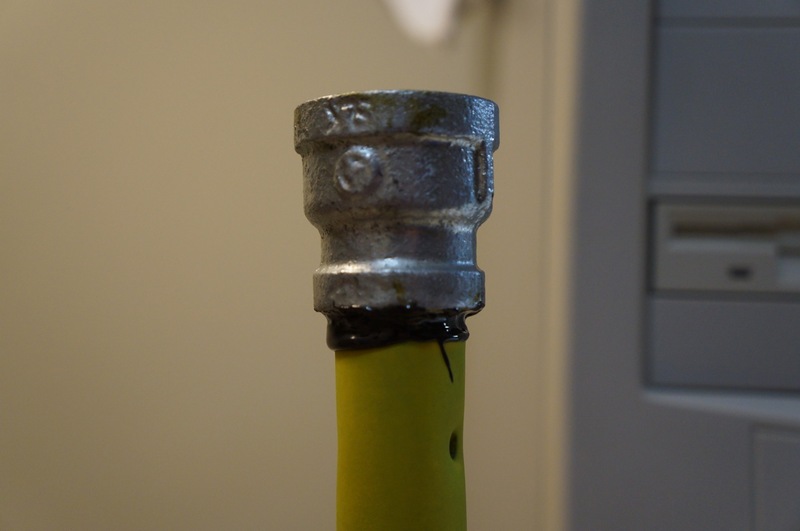 I had to make sure that I did not put too much JB Weld on the tip closest to the 3/4″ pipe thread, which screw into the “close” end of the lightsaber when the blade needs to be drawn. I made sure that it was centered and straight. 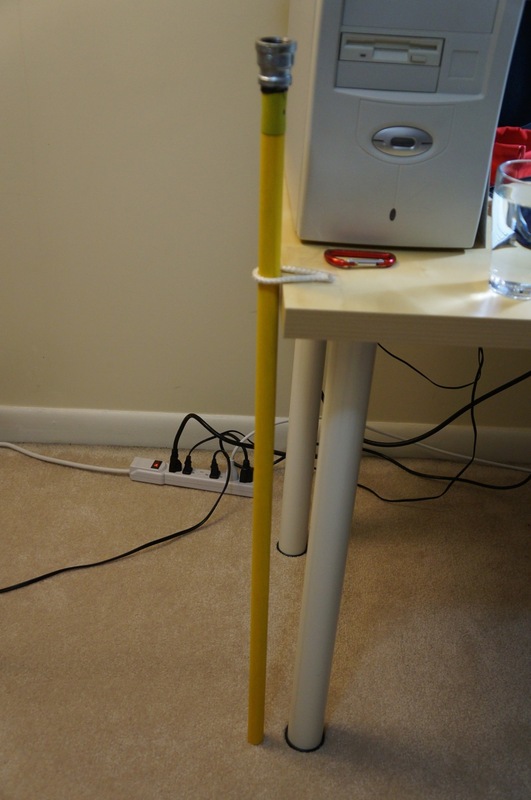 Finally, I painted the dowel rod above the coupling with a primer and then with the florescent yellow. 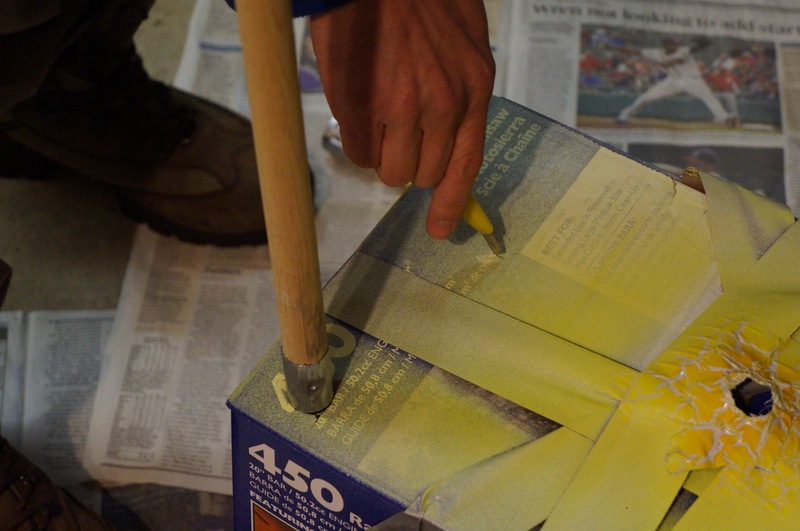 Unfortunately, I misread the spray paint cans and ended up with a mess when the florescent yellow would not stick to the dried primer (I mistakenly picked up white primer + paint instead of simply primer). 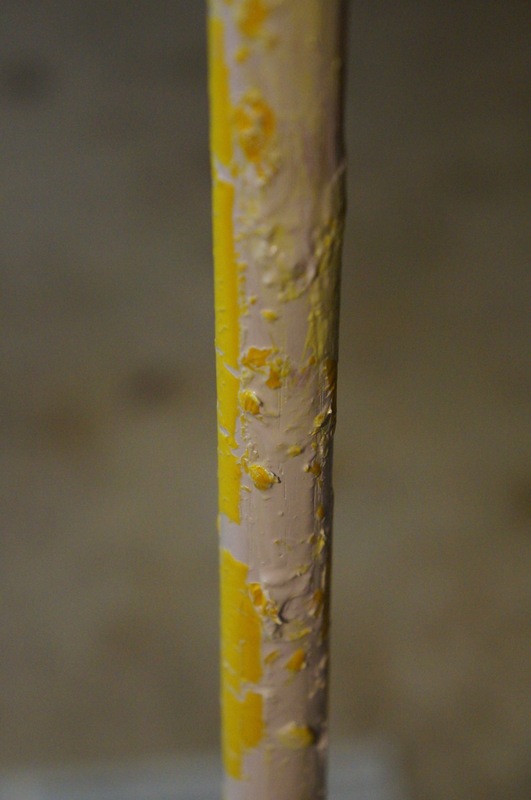 Luckily, I had a paint brush handle in the garage that was long enough to serve the same purpose even if it might be made out of pine instead of oak. 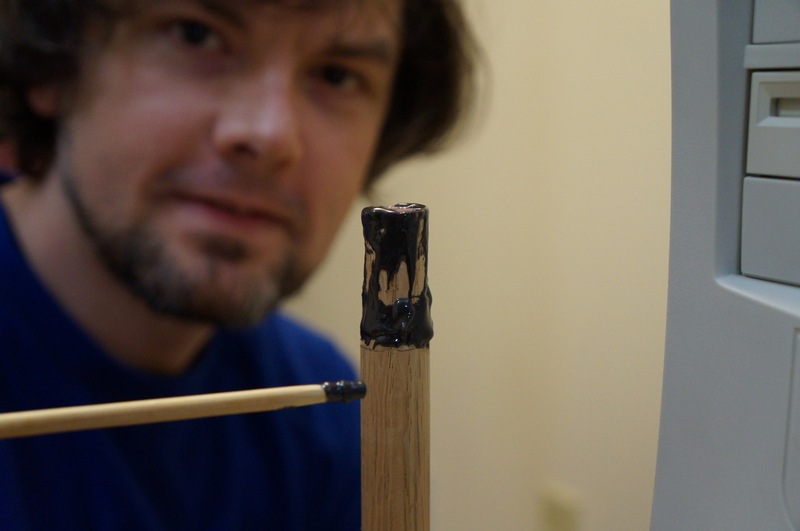 I cut the paint brush handle down to 36″. 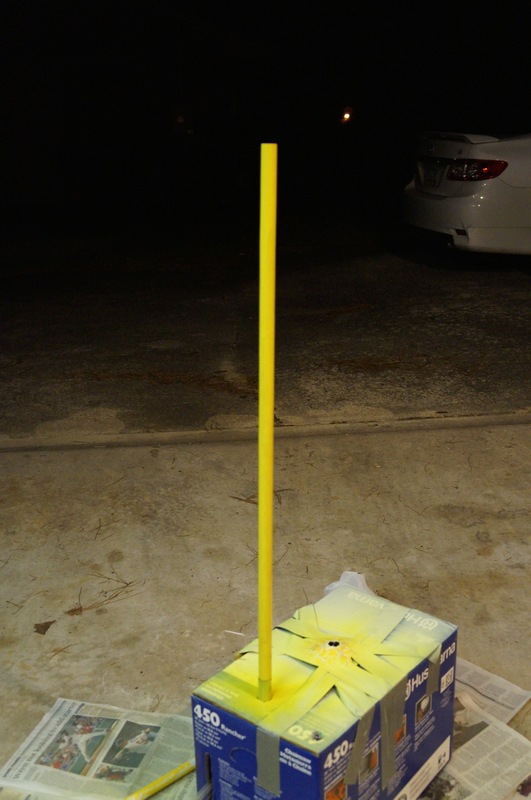 Set it up for painting with the remaining florescent yellow paint. Many coats later, it was a bright yellow befitting a Consular Jedi! 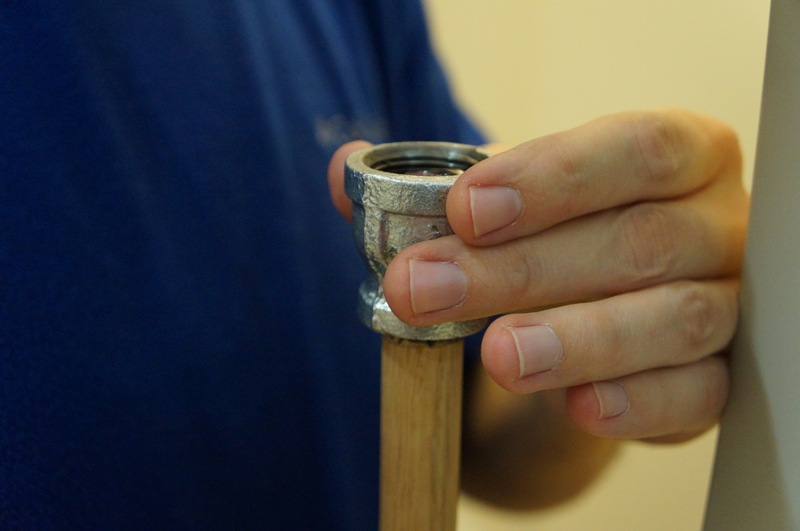 After the paint dried, I screwed the metal end of the brush into another 3/4″ to 1/2″ coupling and bonded the blade to the coupling with JB Weld. 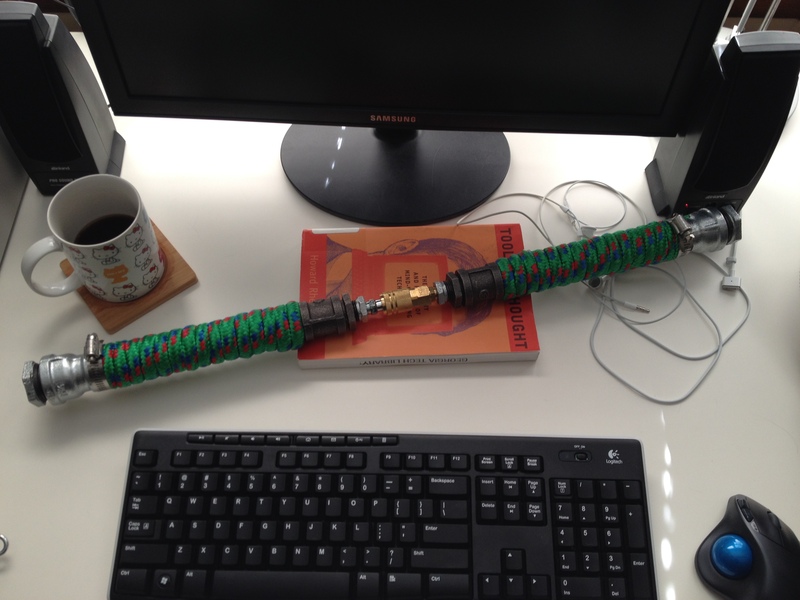 After everything had dried, I mated the blade with the lightsaber handle. I was happy with the outcome of the lightsaber in deactivated mode, too. I gave the lightsaber to Ryan as a birthday present. I included this explanatory diagram that explains how the saber is more than simply parts (e.g., the rope is from the same bundle that Ryan and I used when we cut trees down in my yard last year). 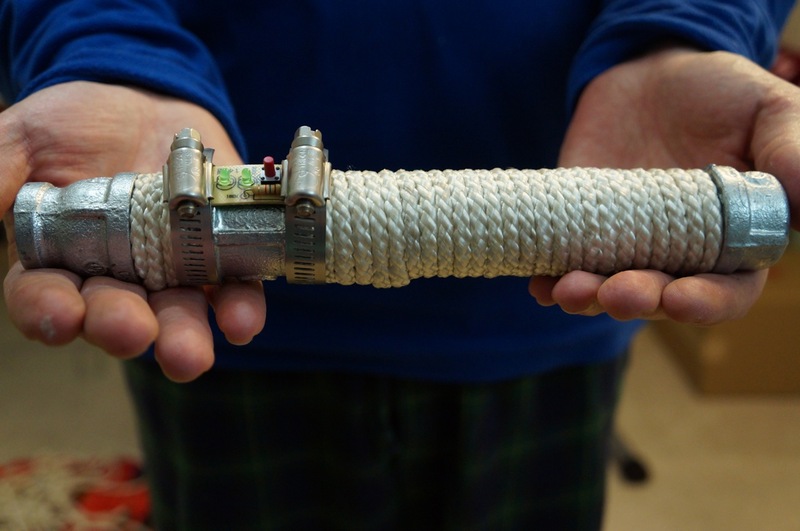 Since I build this lightsaber, Ryan removed the nylon rope grip and improved it with three layers of bank line or tarred twine. The result is quite impressive aesthetically and practically! 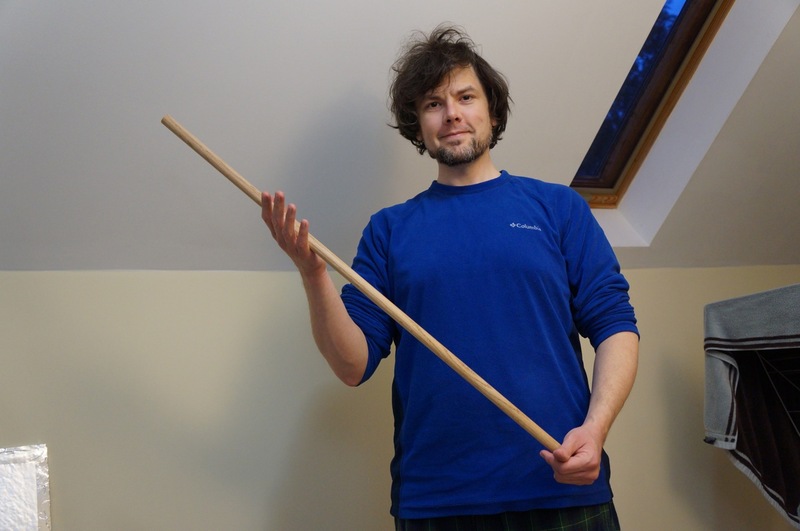 I will post future posts on the lightsabers that I have built for myself and examples of our sparring (when we have the time for Ryan to teach me some things). 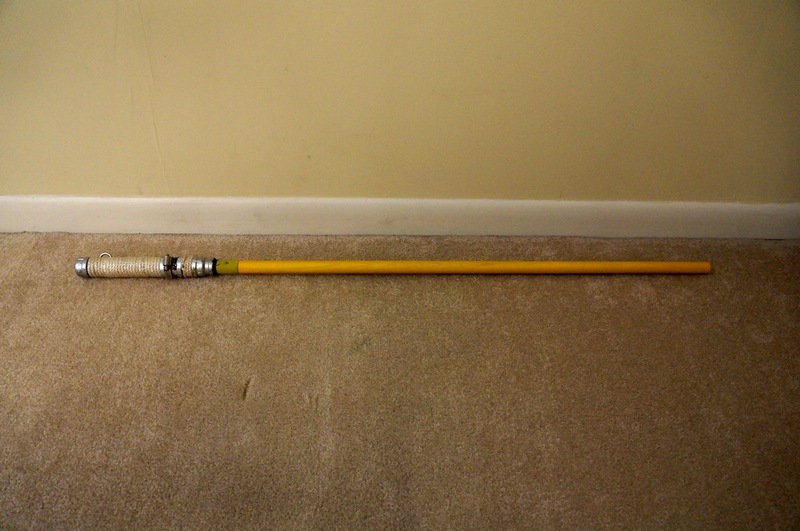 UPDATE: Readers asked me to post photos of my other lightsabers–one inspired by Luke Skywalker’s lightsaber in Return of the Jedi and Darth Maul’s double-bladed lightsaber from The Phantom Menace. 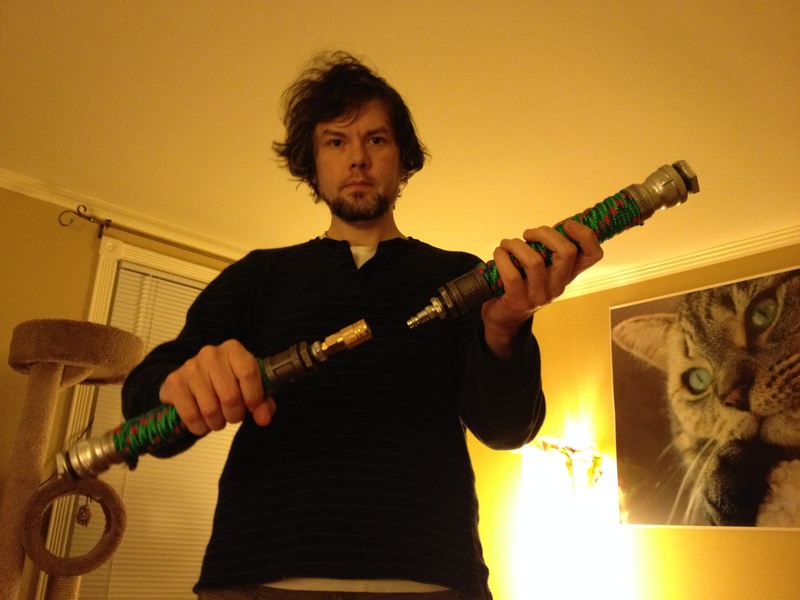 When I built these sabers for myself, I didn’t take as many photos of the process as in the lightsaber above for Ryan, but these photos should illustrate the basics of how to build similar DIY lightsabers. This was the first version of Luke’s lightsaber. I am working from memory as I do not have the lightsaber in front of me to give the exact specifications. 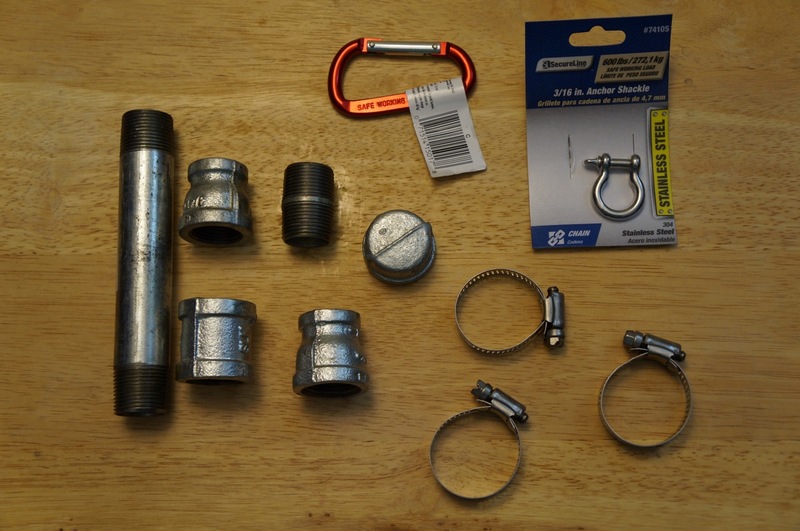 I believe that working from the left to the right: 3/4″ to 1/2″ reducer, 1/2″ threaded pipe 1″ long, 1/2″ to 3/4″ bushing, 3/4″ coupler, 3/4″ pipe 7″ long, 3/4″ coupler, 3/4″ to 1/2″ bushing, flat washer with eye bolt affixed (epoxied into bushing). 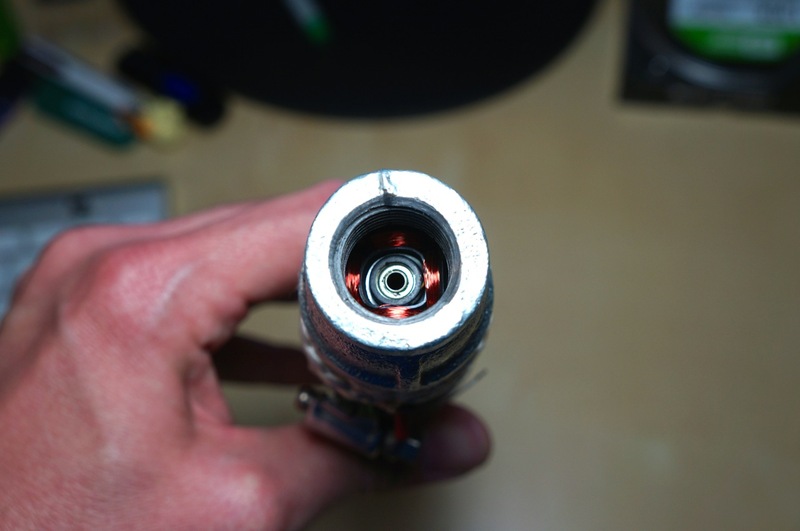 The orange lightsaber control attached to the first coupler is from a computer motherboard heatsink (sawed in half with a hacksaw) and epoxied to the coupler. 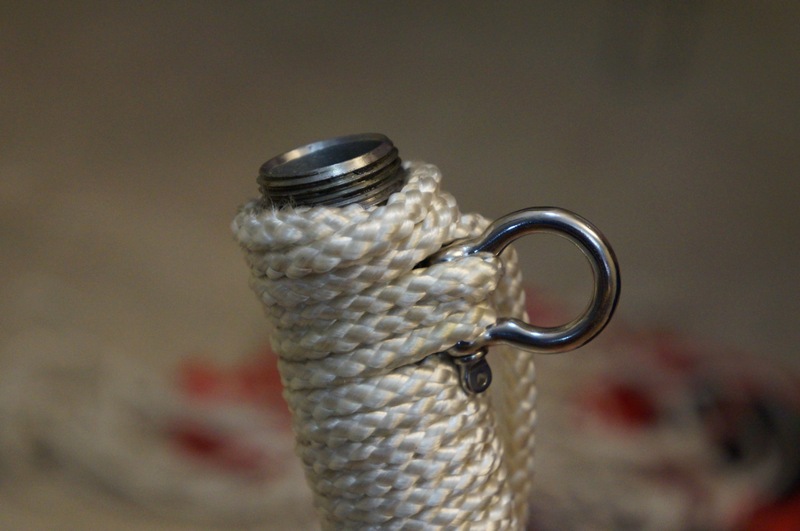 The wrap is nylon rope. 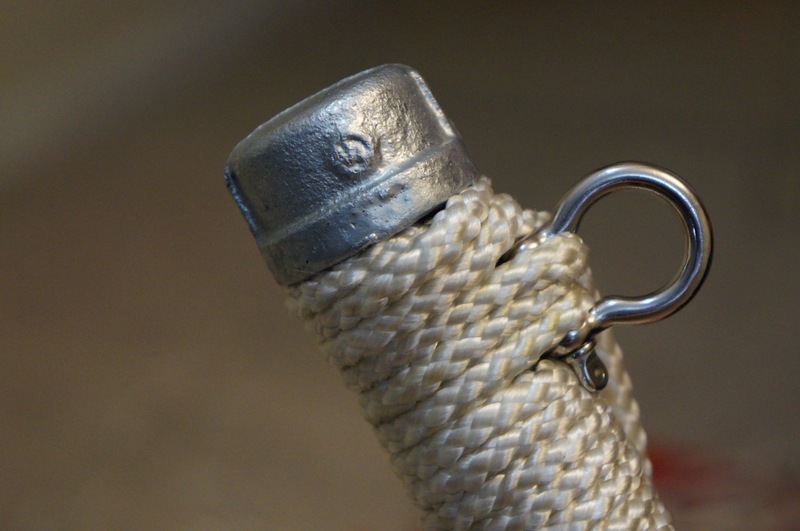 In the next iteration, I replaced the nylon rope wrap with rubber o-rings that I ordered online (pack or 40 or 50). 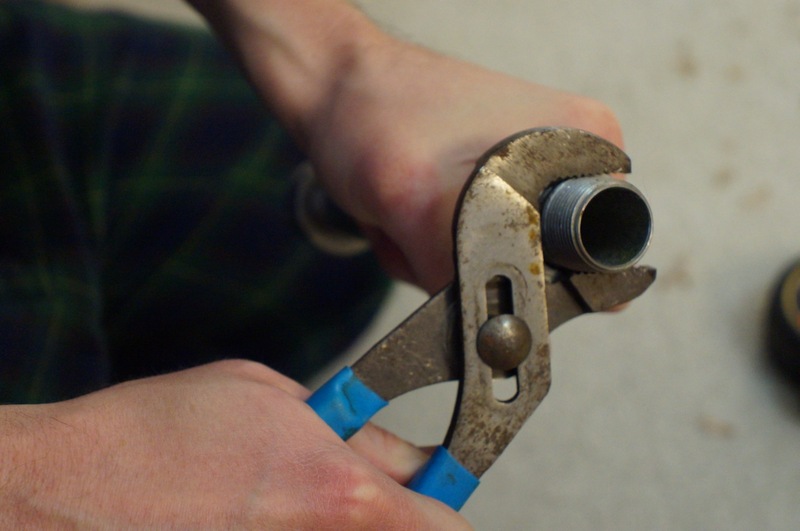 To install the o-rings, remove the last coupler on the right and roll down the o-rings one-by-one. 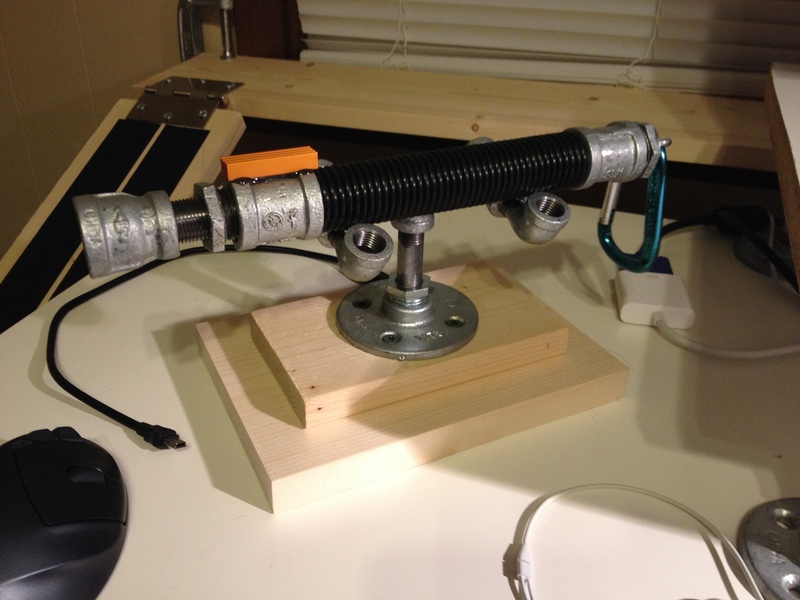 To display Luke’s lightsaber, I used smaller pipes attached to a wood base (two different sizes of lumber screwed together through the metal base connected to the pipes). 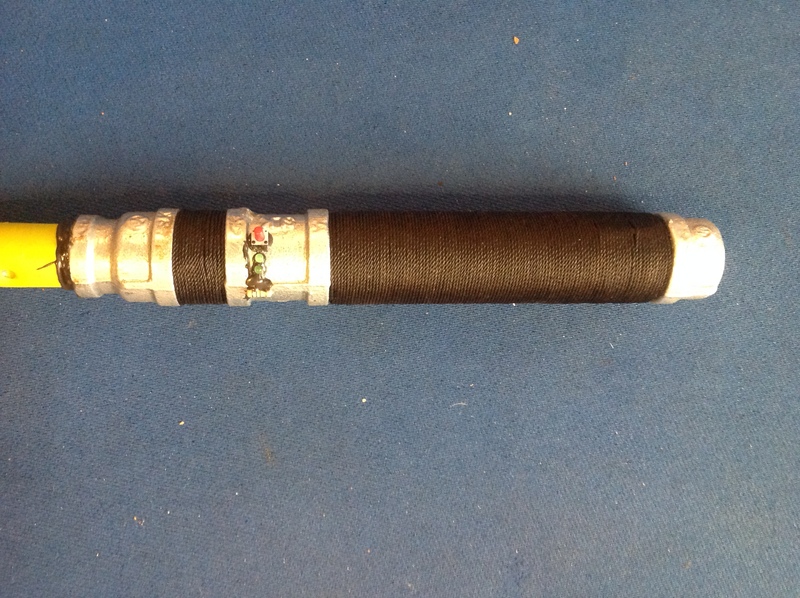 I built this Darth Maul inspired lightsaber as a way to figure out an easy way of having a two bladed saber that can split into two separate lightsabers. 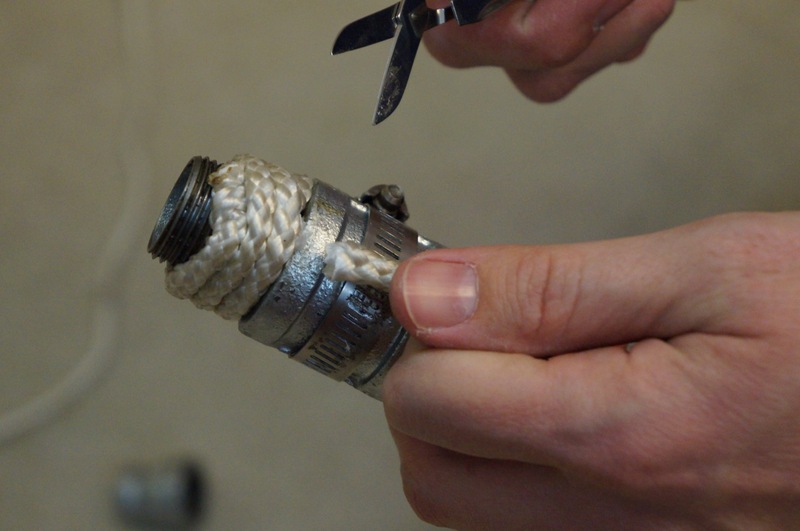 My solution was to use quick disconnect air hose fittings. 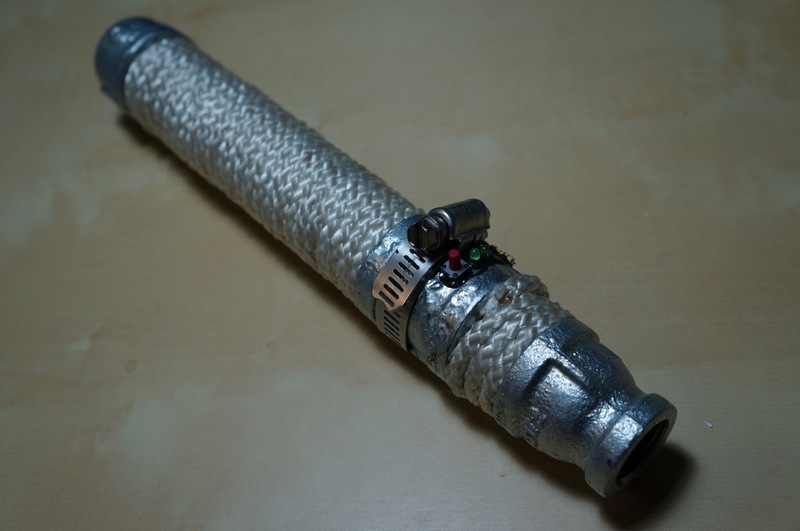 In order to make this work with the larger pipes used for Darth Maul’s lightsaber, which appears heftier in Episode I, I had to use two bushings to reduce down to the smaller size of the air hose fittings. 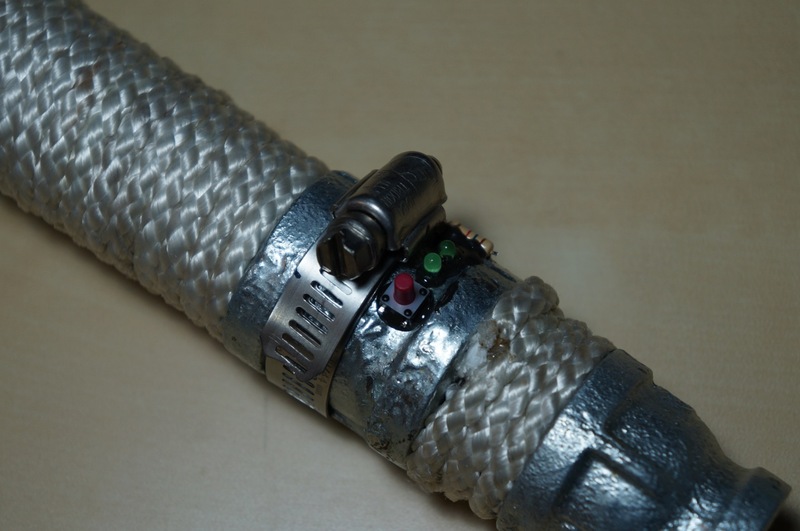 Here is the double-bladed lightsaber connected. Here is the double-bladed lightsaber disconnected into two separate sabers. I didn’t build blade attachments for this saber, so I couldn’t test how much pressure/stress could be applied to the quick disconnect coupler that holds everything together. 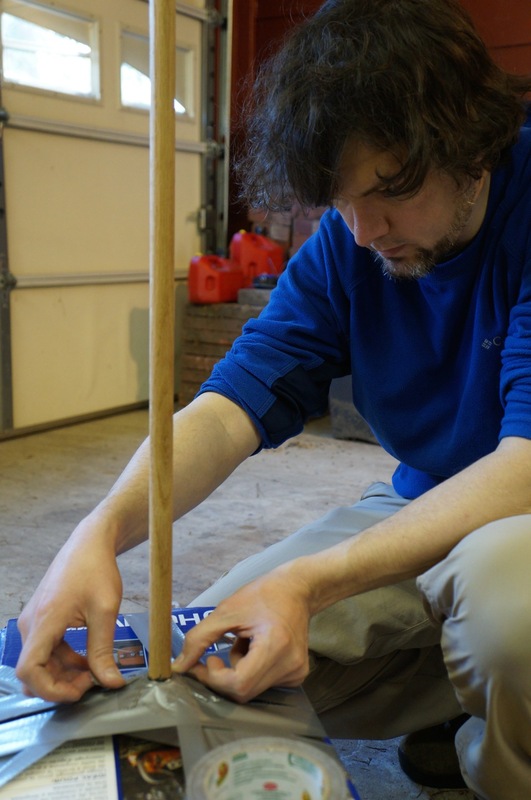 I suspect that this kind of assembly can only be used for show rather than demonstration of saber techniques (as I had constructed the two sabers above). 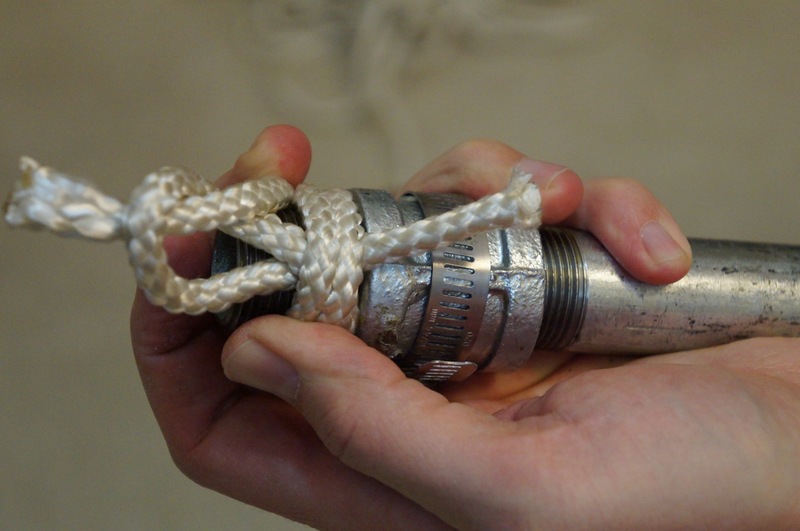 With further modification, I believe that someone could sheath the quick disconnect coupler with metal so that the saber appears more solid from end-to-end instead of having this smaller, weak point in the middle as this demonstration saber appears. I hope these extra photos and explanation help. Good luck with your builds, and please share any photos that you post online of your sabers in the comments below!